MISSION ESL COMPUTER LAB: Carlsbad Cavern National Park, from Voice of America. Carlsbad Cavern National Park, from Voice of America. And I'm Barbara Klein. This week on our program, we explore a UNESCO World Heritage Site in the American Southwest, near the city of Carlsbad, New Mexico. Carlsbad Caverns National Park contains more than one hundred caves below the surface of the desert. Most are closed to the public. 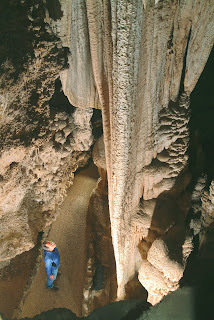 But anyone can visit the main attraction, one of the largest caves in the world. Huge. Incredible. Inspiring. Words like these come to mind as visitors enter a world of silence, darkness and cold, almost two hundred thirty meters under the ground. An elevator lowers you into the world of Carlsbad Cavern, the big cave at Carlsbad Caverns National Park. Silent, except for the voices of guides and visitors. And not completely dark. The National Park Service has enough lighting to see many of the beautiful formations all around. The temperature is about thirteen degrees Celsius. A cavern is a large cave. But Carlsbad Cavern is really a long series of chambers. One of these is called the Big Room. The Big Room is more than three hectares big. The ceiling is seventy-seven meters high. The Big Room is the single largest underground chamber ever found in North America. The Big Room and other parts of the cavern contain huge, sharp formations of minerals. People are free to explore the lit formations in the Big Room. But park rangers must guide visitors to other areas of the cave. Stalactites hang from the ceiling. Stalagmites rise from the floor. Some even meet to create a column. Other formations look like needles, popcorn, pearls and flowers. A visitor still remembers the memory aid she learned long ago from her fifth-grade teacher. Stalactites have to hang on tight to the ceiling or they might fall off. And be careful about stalagmites -- you might trip over one on the floor. 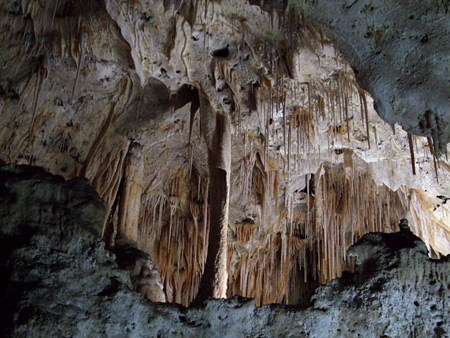 One of the first questions that visitors have is how did Carlsbad Cavern form? Guides explain that it did not result from the action of water and streams like other limestone caves. Instead, it was created by the action of sulfuric acid. The limestone developed about two hundred fifty million years ago. Then, within the last twenty million years, movements in the earth pushed the rock upward, forming the Guadalupe Mountains. Today these mountains extend from west Texas into southeast New Mexico. The action of oil and natural gas created hydrogen sulfide in the limestone. The hydrogen sulfide reacted with oxygen in rainwater moving through the rock. Sulfuric acid developed. The acid created the caves by dissolving the limestone in its path. Later, the water and most of the acid left the caves as the Guadalupe Mountains continued to rise. This permitted freshwater to move through. The freshwater left behind minerals. These minerals became the formations and shapes on the ceilings, walls and floors of the caves. People are not the only ones who visit Carlsbad Caverns National Park. About four hundred thousand Mexican free-tailed bats come to the big cave from Mexico each summer to give birth. Every evening, as the sun goes down, thousands of adult bats fly out of the natural entrance of the cave. It can take from twenty minutes to more than two hours for them all to leave. The bats fly to nearby river valleys to feed on night-flying insects. Then, toward morning, they return to the bat cave within Carlsbad Cavern. Park Service rangers explain that mother bats find their babies by remembering their location, their smell and the sound of their cry. Mothers and pups hang in groups on the ceiling. They spend the day resting and feeding. While the adults go out at night for food, the young bats hang out in the cave for four or five weeks. Then, in July or August, they join their mothers on these nightly flights. 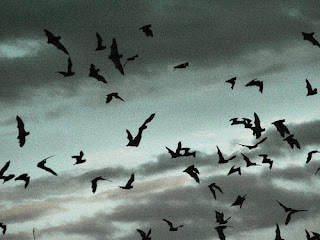 Finally, in late October or early November, the bats all leave and return to Mexico. But they always return the next year. It is easy to imagine that it was the bats that led ancient people to discover the cave. Archeologists and others have found evidence of Ice Age hunters near the cave entrance. They have also found pieces of spear points left about ten thousand years ago. More recently, Apache Indians painted pictures at the entrance. And evidence of one of their cooking areas was found beside a nearby path. Around nineteen hundred, a teenage cowboy named James Larkin White began to explore the cave. The more I thought of it the more I realized that any hole in the ground that could house such a gigantic army of bats must be a whale of a big cave … I crept between cactus until I lay on the brink of the chasm, and looked down. During all the years I'd know of the place, I'd never taken the trouble to do this. There was no bottom in sight! I shall never forget the feeling of aweness it gave me." Jim White told how he built a ladder from rope, wire and sticks and returned to the entrance of the cave a few days later. "I found myself climbing down, down, deeper and deeper into the blackness ... At last my feet touched something solid. I lighted my lantern, and found that I was perched on a narrow ledge, almost at the end of my rope -- literally and figuratively. By now I could see into the tunnel -- it wasn't much farther down to the floor of it, and that floor looked smooth and level. I decided that with a little exhibition of human-fly stuff, I could hold onto the rough wall and go down another twenty feet to level territory. Standing at the entrance of the tunnel I could see ahead of me a darkness so absolutely black it seemed a solid. The light of my lantern was but a sickly glow. Nevertheless, I forged ahead, and with each step the tunnel grew larger, and I felt as though I was wandering into the very core of the Guadalupe Mountains." A few years later, a settler named Abijah Long also found the entrance and went into the cavern. He found huge amounts of bat droppings. Abijah Long hired local workers to mine the guano which he sold to farmers as fertilizer. At the same time, he explored much of the caves. Some people might even say Abijah Long was the first real explorer of Carlsbad Cavern. But Jim White made it his life's work to make sure the public would see and enjoy the cavern. He worked on Abijah Long's mining operation for twenty years. The authors of the book "Carlsbad Cavern: The Early Years" say Jim White took the job for the chance to keep exploring the cave. And after the mining operation closed, he started building paths in the cavern. Yet once he had enough paths built to welcome visitors, no one seemed interested in his "bat cave." Then, in nineteen eighteen, Jim White took a professional photographer into the cave. Ray Davis' pictures of the Big Room appeared in the New York Times. National interest began to grow. In nineteen twenty-three, scientists from the National Geographic Society explored the caves. The following year, President Calvin Coolidge named Carlsbad a national monument. Presidents can declare national monuments, but Congress must act to establish a national park. And that is what Congress did in nineteen thirty. Since then, parts of Carlsbad Caverns have been used for movie sets, weddings, even meetings of the Carlsbad City Council. Park official Marie Merrick says more than four hundred thousand people visited Carlsbad Caverns in two thousand seven. Most visitors go to the main cavern. But some experienced cavers are permitted to explore five "wild" caves in the park. And in another one, scientists are studying microbes in search of a cure for cancer. As for Jim White, he became chief ranger of Carlsbad Caverns. In his story in the book "The Discovery and History of Carlsbad Caverns," he talks about all the work that was done. "I doubt if you can understand how happy this modernizing has made me. It's like the pleasant end to a dream." Our program was written by Nancy Steinbach and produced by Dana Demange. I'm Bob Doughty. And I'm Barbara Klein. Doug Johnson was our reader. 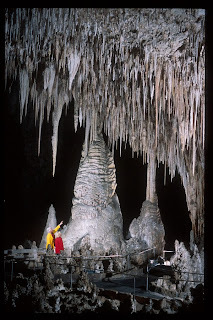 You can discover pictures of the big cave at Carlsbad Caverns, along with transcripts, MP3s and podcasts of our programs, at voaspecialenglish.com. Join us again next week for THIS IS AMERICA in VOA Special English. 1. 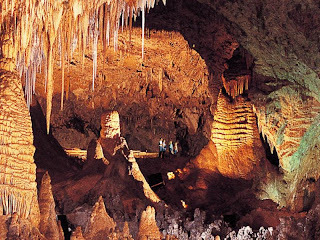 A word that people don't think of when they visit Carlsbad Caverns is "_______ ". 2. Stalactites are rock formations that ______________ . 3. Sulfuric acid combines hydrogen sulfide with ______________ . 4. Mexican free-tailed bats ___________________ . 5. "Guano" is a useful fertilizer. Guano is actually _____________ . 6. Carlsbad Caverns are located in __________________ . 7. In order to climb down into the cave, Jim White ______________ . 8. Carlsbad Caverns is ____________________ . 9. Another name for this article could be "__________________". a: "A Famous Tourist Site in New Mexico"
b: "The Habits of Mexican Bats"
c: "The Science of Underground Caverns"
d: "How Carlsbad Caverns Was Discovered"
10. This article is mainly about _______________________ . For VOA articles on American History, Click Here! "Cave of Swallows, Mexico" from BBC's "Planet Earth"